Available from our Rollright quarry, our traditional walling stone is hand picked and available in bulk bags or loose for delivery or collection. The rollright stone is of a traditional honey coloured stone and both are hard wearing and easy to build with and can be used in a variety of uses. The Cotswold walling stone is suitable for dry stone walling, building stone, retaining walls, landscape projects, interior/exterior cladding and to face gabion baskets. 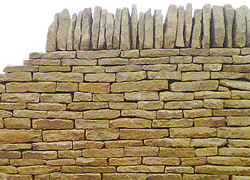 For more information about walling view our article on How to Build a Dry Stone Wall.